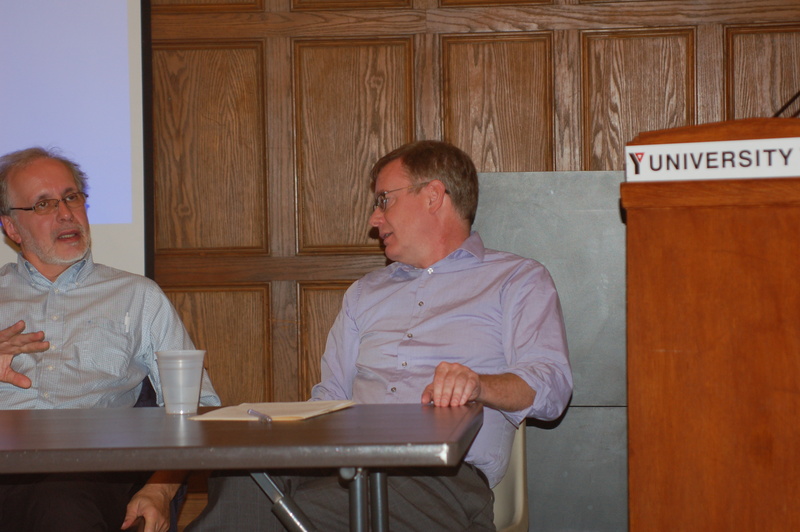 The Campus Faculty Association (AFT-IFT-AAUP) hosted a panel on September 18 at the University YMCA on the topic of shared governance. Three faculty members from around the country spoke about how their faculty unions have strengthened shared governance, and protected faculty rights during times of retrenchment. A fourth speaker examined the potential for a union to strengthen shared governance on our own campus of the University of Illinois. Art Hochner is an Associate Professor in the business school at Temple University, in Philadelphia, where he has taught human resource management since 1978. He is a long-time senator, and serves as president of the faculty union, the Temple Association of University Professionals, which represents 1,350 full-time faculty, librarians, and academic professionals. Ernie Benjamin spoke about his experience as a faculty member and president of the AAUP union at Wayne State University. He highlighted the limited reach of the senate when dealing with faculty working conditions. “The scope of the senate is restricted to educational policy,” he said, adding that even in that realm its authority is limited. George Boulukos teaches English at Southern Illinois University, Carbondale, where he is vice-president of the faculty union and a long-time member of the faculty senate. As Boulukos stated, there are “distinct but complementary roles” for the senate and union. He described an example from their promotion and tenure system. Appeals are decided by an elected, judicial review committee of the senate. The union contract gives substance to that committee’s recommendations by requiring the chancellor to treat those recommendations as if they came directly from the provost. David O’Brien, from the Art History program at the University of Illinois, Urbana-Champaign, described his years of service on various campus committees, and examined the potential for unionization to strengthen the shared governance role of faculty at Illinois.